Ailevator - This is a relatively new term that has sprung up with the advent of the newer computer radio control systems. It is where each elevator in a standard (conventional) or v-tail moves independently, like ailerons on a wing. In addition to each elevator side moving up and down together, each side moves in opposite directions when moving as an ailevator. On a v-tail, this is also known as a ruddervator, as they can serve the same purpose. Typically, both ailevators and ailerons are coupled together to maximize roll performance, especially on larger wingspan planes. AM - AM stands for amplitude modulation and was the only form of radio transmission during the 'early' years of radio controlled modeling. AM is still used, and although it is more prone to interference, lighter and [generally] cheaper radio circuitry can be purchased this way. Similar to AM radios used in cars and in your home, the 'information' that is used to control the plane is transmitted by varying the amplitude of the radio signal. Click Circuitry to read more about AM and radio controls. ARF - ARF is an abbreviation for 'Almost Ready [to] Fly'. For planes that whose kits are designated 'ARF' this means that most of the parts are built and typically need to glued or bolted together and then the radio installed. ARF kits vary from nearly completely built to only 1/2 built. Your mileage may vary, so check with the manufacturers for better information before buying an ARF kit. (I usually don't recommend 100% ARF or RTF kits because since you didn't build the major parts, if your plane gets damaged, it will be a lot harder to repair. Aspect Ratio - When referring to aerodynamics, the aspect ratio of an airplane's wing is the span divided by the chord. Aspect ratio a relative indication of the lift-induced drag that a wing might create. In general, planes with higher aspect ratios, as ones with wide, skinny wings, have less drag. This is why high efficiency gliders have such long wings. There is a trade-off between high vs. low aspect ratios. Planes with low aspect ratios can be much more maneuverable (and thereby have high roll rates!). BNF - Bind and Fly is an term meaning that the plane or other model already has a receiver installed that can be easily "bound" to a 2.4Ghz radio transmitter - by following bind instructions for the kit. Once bound, the model can then be controlled by that transmitter immediately. Brushless Motor - A brushless motor differs from other types of motors, such as cored or coreless in that there are no electrical contacts or 'brushes' that physically touch, completing a circuit. With a brushless motor, there is no contacts to wear out and they are generally more efficient. A brushless motor does require a solid-state electronic controller to control the magnetics inside rather than just applying a voltage to the motor poles. Cored Motor - A Cored motor has a commutator, rotation shaft, metal core and windings for the armature located at the center of the motor. Most electric motors are cored, like motors from slot cars, washing machines, etc. Cored motors are generally heavier than coreless designs which means they don't react as fast, but tend to be cheaper. Coreless Motor - A Coreless motor has the magnet in the center of the motor and the magnetic windings that are in a pattern wound around a cone that cups over the magnet in the motor. This coreless design is much lighter as a cored armature and the wire windings are further away from the center, which can give a higher level of torque as well. For the same current, the coreless motor offers more torque and since it's lighter, the motor can react faster. Carbon Fiber - Carbon fiber is used in planes designed for very high strength wings and fuselages and places where a very high strength element is needed. Carbon fiber is strings of fibers thinner than human hairs and are woven into mats of fibers or cast into rods or other structural elements. Carbon fiber is used in place of fiberglass or Kevlar and when used correctly, stronger than either. CA - CA is short for Cyano-Acrylate adhesive or glue. Cyanoacrylate is a fast setting glue that is very popular in the R/C plane hobby due to its fast setting and high strength capability. There are lots of different brands and different types as well (like thin, thick, safe for foam, etc.). You can read about cyanoacrylates and other glues by clicking Glues. Cyanoacrylates have caused allergic reactions in some people, if you're interested in reading more about this problems, click Sensitivity. CG - CG is short for Center of Gravity and refers to the neutral balance point for a plane. Some planes are sensitive to CG which means that if the CG is too far back or forward, the plane simply won't fly properly at all. Handlaunch sailplanes are typically CG 'sensitive' in that changes of as little as 1/16 of an inch can have a dramatic effect on the performance. A typical CG for a conventional plane (i.e. one that has straight, non-swept back wing and a normal tail, not a flying wing) is balanced on the main spar or the thickest part of the wing. Just put your fingers under the wing at the main spar and see if the tail and nose sections balance level or slightly nose down. Cardiac Hill - This is a place where, after being "killed" in a local combat battle session, you feel like you're having a heart attack after struggling, climbing up back to the slope edge, from the bottom of the hill for the 50th time, gasping for oxygen all the way. Chord - When referring to an airplane's wing, chord refers to the distance between the leading edge and trailing edge of a wing, in the direction that air flows over the surface. These front and back points are called the leading edge and trailing edge, and the distance is the chord. Sometimes a wing's chord is difficult to measure. If a wing was completely rectangular, instead of having some taper or swept back, then the chord would simply be the width of the wing in the direction of airflow. Clevis - Clevises are little clips that are used to connect push rods to servos or to movable control surfaces such as ailerons or rudder, or other surfaces. Clevises are made of different materials, like plastic, nylon, and metal. Choose the right clevis for the right place. I like the black metal ones (Kwik-Links) with a little piece of plastic straw slide over the link to keep them in place and less likely to open in a combat battle. Combat - Click Combat to find out all about combat. Composite - Composite is term that is used to describe a hybrid between modern materials, like carbon fiber or Kevlar. Most of the modern racing sailplanes are termed 'composite' and have beautiful carbon fiber wings that have a core of gray urethane foam. Control horn - Control horns are used to give movable control surfaces movement. A push rod is used to connect a servo to a control horn (via a clevis or z-bend in a wire). The control horn is attached directly to the surface and can be made of nylon (best for combat sailplanes), or wood or metal. Store-bought control horns usually have several holes for connecting the push rod. Holes nearest to the control surface give the surface more movement. Coroplast - Coroplast is the trade name for a form of corrugated plastic. It's particularly useful when used in a combat sailplane for vertical or horizontal stabilizers. Coroplast is very tough, flexible, and light weight. It also comes in a variety of colors and some thicknesses. Coroplast can be glued, sanded, painted to match your plane's color schemes too. The manufacturer's website is Coroplast.com. Decalage - Decalage is the term used to describe the relationship or angle between a wing and a horizontal control surface on the tail. You can read more about some people's experience with adjusting decalage and a plane's CG with their airplanes by clicking the about decalage article. Dihedral - Dihedral is where the right and left wing tips are higher than the fuselage. More dihedral generally means that a plane will be more stable in the air, but will be more difficult to turn in an aerobatic way (as it's more stable). Most planes require a bit of dihedral to fly well. For planes that only have rudder and elevator controls, but no ailerons, dihedral is a necessity. Some planes have more than wing section at a different angle, this is known as polyhedral. Elevator - Elevator is the term used to describe a plane's horizontal control surface on the tail. This surface enables a plane to pitch upwards or downwards. When an elevator surface moves upwards, the tail moves downwards (the nose of the plane then points up) and vice-versa. Without an elevator, it is hard to control the altitude of a plane as you can't control the rise and fall of the nose of the plane. The German word for elevator is Hohenruder [High-rudder]. 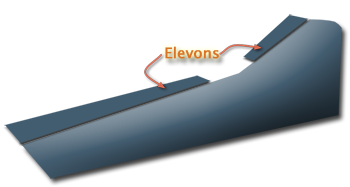 Elevon - Elevon is a term that means both aileron and elevator combined as the same control surface. It is typically used on tailless aircraft such as as flying wings. Like ailerons, an elevon provides for a plane's roll control by moving in opposite directions and like an elevator, provides pitch control by moving up and down together. In order for a plane to have elevons either a computer r/c system is needed or a mixer (either electronic or mechanical). This movement is very similar to what happens in a V-Tail setup. Epoxy - Epoxy is a resin-based adhesive used extensively in the R/C hobby. Epoxy (as a glue) hardens by mixing 1 part resin with (usually) 1 part hardener where a catalytic reaction follows soon after, typically 5 or 30 minutes. You can read about epoxy and other glues by clicking Glues. EPO - EPO is Expanded-PolyOlefin which is now becoming common to ship heavy items in shipping containers. It is not as light as EPS or even EPO, but it is stiff (good for wings) and very durable. Many adhesives and glues don't stick very well to this material, but you can use standard Cyanoacrylate (CA) without the glue dissolving the foam, unlike EPS or EPP. EPP - EPP is Expanded-ProPylene which is commonly used in modern, rubber-like packing forms used when shipping products thru the mail. Not too many glues will stick very well to this foam, but hot-melt, shoo-goo, and epoxy stick relatively well. EPS - EPS is Expanded-PolyStyrene and is commonly used in those white-foam coffee cups and the older style white packing 'peanuts' used to ship products in the mail. This foam is particularly sensitive to acetone and other aromatic liquids. Ordinary Cyanoacrylate (CA) glues will also 'attack' this foam and cause it to 'melt'. Surprisingly, white glues or aliphatic resin adhesives adhere remarkably well to this type of foam. Flapperon - Flapperons are similar to spoilerons in that they provide an aileron with the added bonus of a flap function without needing a separate control surface for each. As the flap function is increased (flaps lowered), both ailerons droop downwards like flaps, but aileron control is still present (i.e. the ailerons can still move in opposing directions for roll control). With computer radios, it is fairly easy to enable the flapperon or spoileron option (as long as a separate servo is used for each control surface). Flaps - Flaps are movable control surfaces that are present on the trailing edge of the wing. Each together moves downward to give a wing extra lift. Flaps are considered to be flaps if each is separate from the aileron control surface. Flaps are typically placed on the in-board section of the wing's trailing edges (that's the part of the wing closest to the fuselage). When flaps are combined with ailerons, those surfaces are typically called flapperons. For those building kits that have German instructions, the word for flaps is Wolbklappen. FM - FM stands for frequency modulation and the most common form of radio transmission used in radio controlled modeling. FM radio modulation is less prone to interference than AM. The control information is transmitted by varying the frequency of the radio signal. Click Circuitry to read more about FM and radio controls. Full House - Full House is a name that is used when describing R/C sailplanes that have ailerons, flaps, rudder, and elevator. Also, usually there are fancy features built in as well. By using a computer radio, you can program the radio to mix or couple certain surfaces together. For example, some people mix in the flaps (or flapperons) to move downwards when 'up' elevator is applied or have different 'modes' of flying like landing or reflex mode. Landing mode could be programmed to be something like having the flaps lower a few degrees and having the both ailerons raise upwards. This is sometimes known as 'crow'. Gold-N-Rod - The Gold-N-Rod or Golden rod is the tradename for a type of plastic push rod sold by Sullivan products. It is composed of an outer 'sleeve' of hard plastic (a little bit smaller diameter as a plastic drinking straw) and an inner 'rod' of nylon. The inner rod slides smoothly inside the plastic sleeve and allows a flexible push rod system for controlling flying surfaces such as an elevator or rudder. Handlaunch - Handlaunch is a term used to describe smaller, lighter radio controlled sailplanes that have been designed to launch by hand to seek out thermals and fly high without the means of a hi-start or other means of launching. Click Handlaunch to visit the handlaunch sailplane page. Hi-Start - Hi-Start is a length of rubber elastic material, such as surgical tubing and a length of nylon or other cord tied together. Hi-starts are usually constructed of several hundred feet of surgical rubber tubing connected to an even longer piece of line (twice as long, typically) either braided nylon cord or a single strand of monofilament (fishing line). One end of the rubber elastic is staked into the ground and the other end (the cord end), has a ring fastened on that end. The ring is slipped over a hook, known as a tow-hook on the sailplane and you stretch the hi-start a considerable distance. All of this is used to launch a sailplane to very high heights without much effort. Kevlar - Kevlar is very strong fiber that was developed by the DuPont Corporation and is also known as Aramid. It's primary use was developed for strong, steel-replacement structures such as high pressure tanks and space-age structures. As it turns out, Kevlar makes a nice material for building fiberglass fuselages and covering composite, lightweight wings, in the same manner as carbon fiber. Kwik Link - Kwik Link is the trade name for a metal clevis that is very popular in the R/C modeling hobby. The metal clevises are strong and have very little flex when installed properly. These are my favorite type of clevis vs. using the nylon clevis. Lithium Polymer, Li-Poly, LiPo [batteries] - Lithium ion polymer batteries, or more commonly lithium polymer batteries (sometimes abbreviated Li-Poly or LiPo) are rechargeable batteries which have descended from lithium ion batteries. Original lithium ion batteries had its electrolyte combined with an organic solvent, making them very stable and long-lasting, but a bit flammable, and not easily rechargeable (or not at all). With Li-Poly, the electrolyte is held in a solid polymer composite such as polyacrylonitrile or other plastic-like mediums. Li-Poly batteries are actually lighter than Li-Ion and since they're not as dangerous as before, they're commonly found throughout consumer products. Oh, they're also much lighter than NiCad or NiHd batteries with the same capacity! But, you must be careful when using these batteries because a 2-cell pack produces 7.4 volts, which can damage receivers not rated for that voltage. You must use a voltage regulator in receivers that are only rated to 6v. Lithium Iron, LiFe [batteries] - Lithium iron phosphate (LiFePo4) batteries, are also called LFP battery (with "LFP" standing for "lithium ferrophosphate"). "Life" batteries are a new formulation of lithium chemistry that are considerably safer than LiPo batteries since exposure to air of the electrolyte won't catch on fire. The voltage from each cell, 3.3v, is lower than LiPo batteries, but capacity is roughly the same. The lower voltage actually makes use of these newer batteries as receiver packs in a plane because the sum of two cells is 6.6v rather than 7.4v. Some receivers will burn out voltages over 7v is applied to the circuitry. MAC - MAC stands for Mean Aerodynamic Chord. MAC is the chord through the centroid of a single wing's plan area. A wing's chord can be difficult to measure because only if a wing was completely rectangular is the MAC equal to the chord. Most wing's aerodynamic centers are at 25% MAC. The ratio of the chord of a wing to its span is known as the aspect ratio. Aspect ratio a relative indication of the lift-induced drag the wing might create. In general, planes with higher aspect ratios, as ones with wide, skinny wings, have less drag. This is why high efficiency gliders have such long wings. Mixer - The name Mixer in the R/C hobby means either a device or function used to mix one or more control surface functions together, such as elevons, flapperons, or ruddervators. You can see a common use of a mixer by clicking Mixers. Model Memory - Model memories is the ability for a transmitter to store several different preferences or settings in a 'memory', each for a separate model plane. Some even can store up to 64 different models with the same transmitter so that you only have to have one transmitter and many different receivers. NiCad - NiCad is another name for Nickel-Cadmium rechargeable battery. NiCads are used extensively in the R/C hobby (and everywhere from toothbrushes to telephones). NiCads are packaged in a variety of different ways with differing number of individual battery cells. Typically you will find a battery 'pack' with 4 cells connected together. Each cell supplies for 1.2 volts (nominal), so in a pack of 4, the battery provides the rest of the R/C system with a total of 4.8 volts. NiCads have a variety of different capacities (how long they'll last), from 50 milli-Amp-Hour (mAH) to as much 2200 mAH. NiCads can be slow or fast charged and can endure hundreds or even thousands of recharge cycles. NiHd, NiMH, or NiHy [batteries] - Nickel- [Metal] Hydride is an alternative to NiCad batteries as they are about the same weight, but have higher capacities than their NiCad cousins. These batteries are harder to charge (most don't like to be fast charged as these batteries do not develop a large enough voltage peak as NiCads do). NiMH batteries have a much higher internal resistance, so lots of people believe that these types of batteries should not be used in airborne (receiver) packs. This internal resistance can essentially cause too much of an overall voltage drop if one or more servos 'stall'. A servo stall can draw as much as 800 or 900 mA which could then cause the receiver to not get enough voltage and the R/C system would then be non-responsive. One of the advantages of these batteries and NiCad batteries are that are a safer to charge than the Lithium batteries commonly used today. Open Class - Open class is a term associated with the larger wingspan, high performance sailplanes. Click Open Class to visit a list of open class sailplanes. Oxygen - This is what you gasp for after climbing cardiac hill retrieving your just 'downed' combat plane. PCM - PCM stands for Pulse Code Modulation and actually is still a form of FM radio modulation. The difference between PCM and FM is that the control information is sent in the form of a digital data pulse [word] rather than just an analog signal pulse. I suppose you could compare this to your cassette audio tape and an audio CD. FM would be the tape and PCM the CD. Click Circuitry to read more about PCM and radio controls. Pitcheron - Pitcheron is a term used to describe a plane that has no moving elevator control surface. Instead, the wings pivot together, changing in relation to elevator. This supplies the pitch action that a normal elevator would provide. Typically, a pitcheron plane also is a wingeron plane, in that the wings pivot in an opposing manner to provide for roll control. Polyhedral - Polyhedral is a term that describes a wing that has 2 or more separate wing panels for both the right and left wings. Each panel has a different dihedral angle. Planes that have a polyhedral setup are typically more stable and more forgiving in most flying conditions, at the expense of being less maneverable. Pulse Charging - Pulse charging is a term that is being used in the rechargeable battery technology business. This charging method is claimed to charge a NiCad or NiHi battery pack by starting and stopping the charge and letting the cells 'rest' very briefly between charges. The theory is that this produces less oxygen bubbles on the plates of the batteries and thereby more efficiently. Push Rod - Push Rods are used in R/C sailplanes to move, back and forth control surfaces. RCSE - RCSE stands for the Radio Controlled Soaring Exchange. This is a mailing list that sends messages to and from R/C soaring enthusiasts from all over the world. You can subscribe to RCSE by sending a message to soaring@airage.com with the single word 'subscribe' in the body of your message (make sure your return address is correct as the mailing list will reply to your message by sending back an acknowledgement). Receiver - A receiver is the part of a R/C radio system that is in the plane and 'receives' commands from a transmitter. When you move the 'sticks' on the transmitter, a different signal is sent to the receiver and the receiver translates this signal into movement in the servos. RTF - RTF is an abbreviation meaning 'Ready-To-Fly'. Ready-To-Fly doesn't always mean that it's REALLY ready to fly, but it tends to mean that most the of the parts are built and most of the time you just need to add the radio. There are some planes available where the radio is installed and all that needs to be done is to charge the plane and that's it. Some kits are also designated 'ARF' meaning 'Almost Ready [to] Fly'. Ruddervator - Ruddervator is a term that describes a control surface that is combination of rudder and elevator. Ruddervator is the name of the moving surfaces present on a v-tail plane. RX - RX is an abbreviation of the term Receiver. Servo - Servos are the parts of a R/C system that moves the control surfaces in response to movement on the transmitter 'sticks'. Each servo has a small motor and gears to give the motor some mechanical strength to move each control surface. Servos have a certain amount of torque (strength) that is generally proportional to their size or cost (i.e. the bigger [or more expensive] the servo, the stronger). Servos come in all kinds of sizes and strengths and weight. You should choose the right servo for the right plane. For handlaunch sailplanes, small, lightweight servos are the right choice. For combat, strong servos are best, but cheap, standard servos are probably the right choice as if you break a cheap servo, you just won't mind as much. Click Servos to read about servo wiring or Servo Chart for a comparison of most readily available servos. Spoileron - Spoileron is the term applied to a control surface that is the combination of ailerons and spoilers. Like flapperons, spoilerons are on the trailing edge of the wing, but move upwards to 'spoil' the lift. Spoilerons are useful to 'scrub off' extra lift for more precise landings or to increase the ability to make quicker turns. When a plane is inverted, the spoilerons are now flapperons, so typically, flapperons and spoilerons are usually present on the same plane. With computer radios, it is fairly easy to enable the flapperon or spoileron option (as long as a separate servo is used for each control surface). 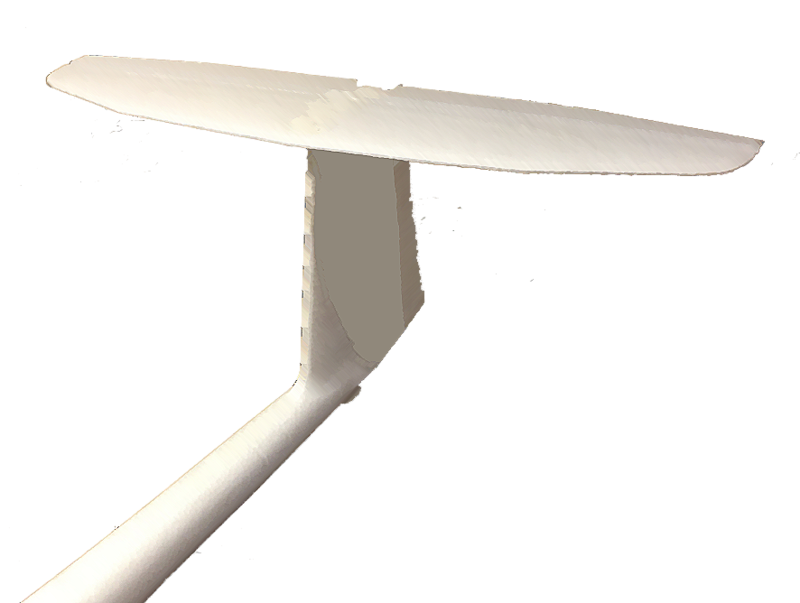 Spoiler - Spoilers are movable surfaces that are present on a wing that 'spoil' the lift. Spoilers are useful to get a plane down on those 'high lift' days or in to make more precise landings. Some spoilers are raise-able plates that lift upwards while other forms of spoilers are merely ailerons and/or flaps that move upwards. See spoileron, above, for more information. In German, the word for spoiler is Landeklappen. T-Tail - T-Tail aircraft are planes that the elevator surface mounted to the top of the rudder section - resembling a "T" shape, hence the name. You can find the use of T-Tails on many different types of sailplanes and even large commercial jets, such as the DC-9 or Boeing 727. One of the reasons pilots like T-Tail controls is that the elevator surface is so high above the ground when landing so that it's less likely to be broken. Thermal - Thermals are columns of rising warm air that both model and full size sailplanes take advantage of when trying to stay aloft. There are all kinds of thermals, some are small 'puffs', while others are monstrous. I've been in thermals that were strong and difficult to 'get out of'. The art of spotting and utilizing the rising air in a thermal one of the most interesting things to master. Torque - Torque is the measurement of force given over a distance. For example, imagine a lever (like a crowbar) where you apply a force along its length (like to pry open something). This lever's torque is that force multipled by the length away from the pry point. For servos, think about the servo rotating a servo arm, the torque is the length of that arm multiplied by the force. In the USA, most servo torque is measured in oz-in (force in ounces times inches, or ounce-inch). Servo torque is measured by using force or weight at a radius from center of the output shaft to see when the servo stalls as it tries to lift the weight horizontally. To convert oz-in to kilogram-centimeters (kg-cm) just divide by 13.9, or click the "Weight Converter". Transmitter - Transmitter is the 'sending' or 'transmitting' part of a R/C radio system and is the box you hold in your hand. You move the gimbals or 'sticks' on the transmitter and the receiver detects a change in transmitting signal and moves the servos accordingly. Transmitters can send between 2 and 24 channels (separate signals, one for each desired function). Typical transmitters are 4 to 6 channels (and that's usually enough for most planes). Triple Taper - Triple taper is a building style sometimes popular with composite full house and slope racing planes. The wing has three different leading edges and produces a nice compromise between a crescent shape (best efficiency) and a single tapered wing, i.e. it's easier to build. TX - TX is an abbreviation for transmitter. V-Tail - V-Tail aircraft are planes that have only 2 stabilization surfaces (in the shape of a V) instead of a conventional horizontal and vertical stabilizers. In a V-Tail aircraft, the 2 control surfaces of the V-Tail work together to give elevator and rudder responses. For elevator control, both surfaces move up and down together. For rudder both surfaces move in opposite directions. For both elevator and rudder to be used at the same time, both these movements need to be 'mixed' together to get a proper response out of the aircraft. Click V-Tails and Elevons to get more information about V-Tails and mixers. Wingeron - Wingeron is the term applied to wings that individually pivot to provide roll control in a plane. There are no moving control surfaces, rather, each wing, by pivoting in opposite directions performs the same function as ailerons.